We sell the Fallguard net, because of its quality construction and durability. The self-supporting frame is built out of schedule 40 electrical PVC (PURCHASED FROM YOUR LOCAL HARDWARE STORE). The black inner netting has outer support ropes, which adds extra support to the netting and also keeps the net from sagging and tearing away at the top. Remember a safety net is to protect the jumper from falling off the trampoline, it is not there for the jumper to bounce off of, hang from, or to allow more than one jumper. 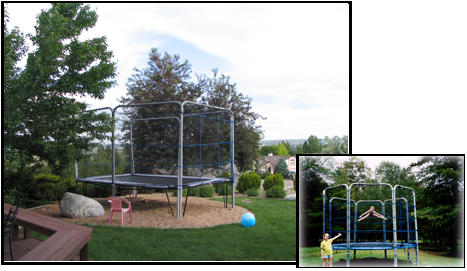 All the safety rules that come with your trampoline need to be followed with or without a net. Remember, the purpose of a safety net is to protect the jumper from falling off the trampoline. Jumpers should never bounce into or hang from the net. There should always only be one jumper at a time. 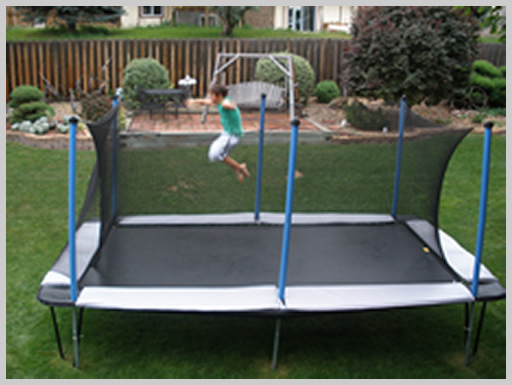 All the safety rules that come with your trampoline need to be followed with or without a net. Tramp Master sells a safety net that has been adapted to fit the Tramp Master frame. The net extends up above the bed about 6’. It secures to the outer edge of the bed.